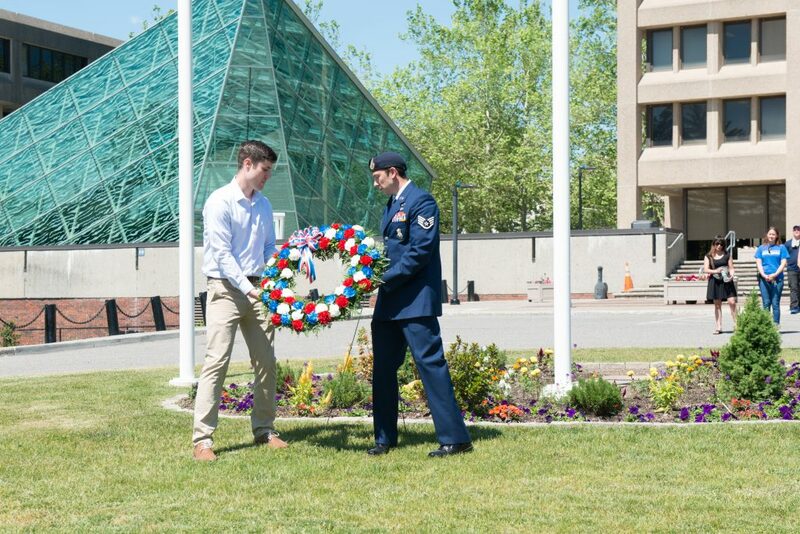 SUNY New Paltz community members took time to honor fallen heroes at the annual Memorial Day wreath-laying ceremony, held beneath the flag poles outside the Haggerty Administration Building on May 31. The event, organized by the Office of Veteran & Military Services, offers an opportunity for the hundreds of veterans, service members and dependents who are either enrolled as students or employed by the College to come together with civilian colleagues and reflect on the meaning of service and sacrifice. This year’s ceremony was emceed by Niza Cardona, director of Student Accounts, who performed this duty in lieu of Veteran & Military Services Coordinator Jason Gilliland, a service member whose commitment annual military training kept him from attending the campus wreath-laying. Keynote remarks were offered by alumnus and combat veteran Thomas Pulaski ’15 (Marketing) ‘16g (Business Administration). Pulaski was then joined by Timothy Toomey ’17 (Political Science), also a combat veteran, in laying the ceremonial wreath at the base of the flag, as fellow student Nick Summers ’16 (Mathematics, Music – Jazz Performance) gave his rendering of “Taps” on trumpet. William Hennessey, Inter-library Loan clerk for the Sojourner Truth Library and a former service member, performed “Amazing Grace” on bagpipes. More information about Veteran & Military Services at SUNY New Paltz is available online.